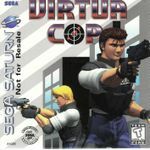 "Virtua Cop (known as Virtua Squad for the North American PC version) is a shooter arcade game created by Sega-AM2, and headed by Yu Suzuki. Its original incarnation was an arcade game in 1994 and it was later ported to the Sega Saturn in 1995, and the PC in 1997. It was later bundled with Virtua Cop 2 in Japan and Europe on the PlayStation 2 as Virtua Cop: Elite Edition (Virtua Cop Rebirth in Japan) on August 25, 2002 and November 29, 2002 respectively. It included gallery extras and implementation of Namco's G-Con 2 lightgun support. " Source: Wikipedia, "Virtua_Cop," available under the CC-BY-SA License.